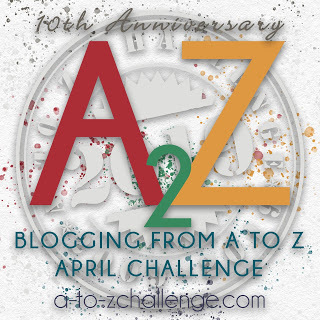 Lynda Grace An Hour Away: A-Z Challenge U is for RedFoo Who? This Thursday’s letter is U for Unhip. One of the shows we watch is “Dancing with the Stars.” Although, I have to admit, I am getting a little bored with it. Now I am a little more with it than Ross as far as pop-culture goes. However, when I watch any of the music award shows, I quickly realize that I don’t really know all that much either. So, it was no surprise that neither one of us knew who this performer was. I am sure, though, that you all are much hipper than Ross and me. Do you know who RedFoo is?
" 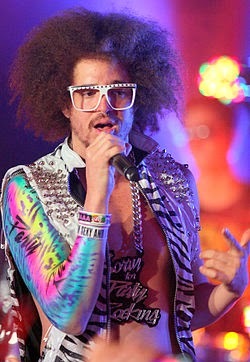 Stefan Kendal Gordy (born September 3, 1975), better known by his stage name Redfoo, is an American singer, dancer, record producer, DJ and rapper best known as part of the musical duo LMFAO. He formed the duo with his nephew, SkyBlu in 2006 and they released two studio albums before going on hiatus in 2012. He is the youngest son of Motown Record Company founder Berry Gordy, Jr”. Never heard of him, nor have I watched Dancing with the Stars, though it does look interesting. I tend to go more towards American Idol, maybe because I have 2 left feet? We also watch Idol, but, I’ll tell you, I’m ready for a change with these shows. It seems as though it’s more about the judges than the young talent. Actually, I think I am just bored with TV ion general. Seems like LMFAO had like one hit. It was kinda a fun song. If there were others, I missed them. Well, I was more interested in the fact that he is Berry Gordy’s son. Now him I know. I think I'm fairly hip too and I didn't know this person. I have heard of LMFAO however. I quit watching DWTS, but I still like Idol a lot! It’s no wonder that I don’t know today’s music or even 10 years ago music. I very rarely listen to the radio and never watch MTV or VHI. Actually watching Idol keeps me somewhat in touch. I’m rooting for Jena Irene. I think she has the most unique voice and is quite versatile. The only time I watched Dancing with the Stars was when Jennifer Grey performed. She was excellent. I am not hip musically. I read trashy magazines and People.com, so I'm sometimes up on celebrity and royal stuff. Watching DWTS has become a habit with us. I watch John Stewart, The View and the Tonight Show. That kind of keeps me somewhat updated…with pop culture anyway.